I’ve been mainly playing Final Fantasy XIII the past weeks and those of you who follow my tweets will know how frustrated I am by it. It’s not that it’s a bad game, but I really don’t like how linear FFXIII is; the first 30 hours there’s basically only 1 way to play the game. So when I got a review copy of Rune Factory: Frontier, it felt like the perfect antidote to the linearity of FFXIII: this game is so open and non-linear, there are tons of ways you can play it. Rune Factory: Frontier is the third title of the Rune Factory series, but the first to appear on the Wii (the previous two were for the Nintendo DS). The original was a spin-off of the Harvest Moon video game series, and takes the farming aspect of the Harvest Moon series, but adds a dungeon crawling sword wielding side to it. I haven’t played any of the predecessors (neither from the Rune Factory series or the Harvest Moon series), but you don’t need any knowledge about any of those games. This game starts with your character Raguna waking up to discover he has amnesia (of course). He moves to a new town, gets his own farm and some tools to start farming. Oh, and you get introduced to a bunch of girls, who you can potentially woo and marry. There are barely any forced tutorials or anything like that; the game just lets go and gives you the freedom to do whatever you want. You start the game with the main activity of farming. You get a couple of seeds, a hoe and a watering can, and your own little field where you can sow and grow your crops. After sowing seeds, you have to water your crops once a day, until they are fully grown and you can harvest them. It of course depends on the type of seeds how many days it takes for them to grow; turnips (the seeds you start the game with) take 4 days. One minute in real life is one hour in the game world, so 24 minutes is one day. 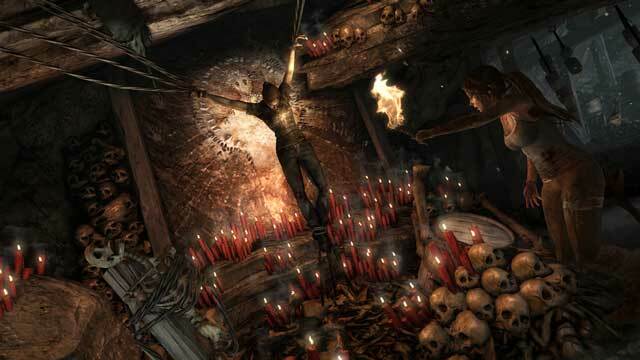 Next to farming, you can dungeon crawl. You can buy a proper weapon (like a sword) or you can be cheap and use your hoe. Either way you can start dungeon crawling and destroying monsters straightaway (well you’re not actually ‘destroying’ them, you’re sending them back to the First world or something like that). Besides those two main activities, you can also learn to do other stuff, like cooking and fishing, but you have to find the right tools to start those (mainly by talking to the right people). And then there’s the ‘love’ game. There are twelve girls in the village you can woo (and eventually end up marrying), each with different likes and dislikes. Each of them (and each of the other NPCs you come across) has a “Love Points” bar that increases as you show them affection. You do this by giving them presents they like (for instance, one girl might like turnips, another one roses). The girls are a bit stereotypical (you have the librarian, the inn keeper’s daughter, etc), but it’s still a lot of fun, figuring out what to get for each of them. 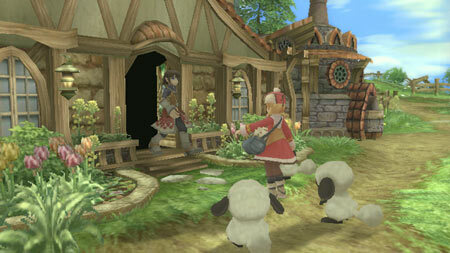 Rune Factory: Frontier is a cute RPG and one that requires more than a few hours of dedication. I love how much freedom the game gives you, letting you focus on those parts of the game that you like (instead of having to do everything). It’s perfect for someone as neurotic as me, trying to collect and create all the items (seriously, if I didn’t have video games, I’d be a crazy cat collector or worse: stamps). 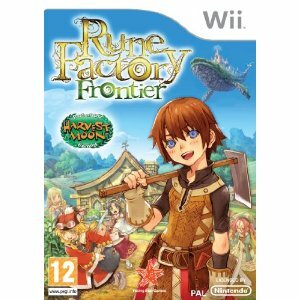 Rune Factory: Frontier is available on Amazon.co.uk for £23.97 and on Amazon.com for $29.99. 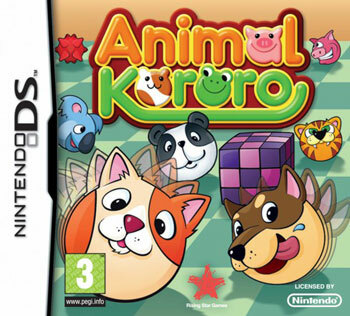 A couple of weeks ago I was asked whether I’d like to try out the game Animal Kororo for the Nintendo DS. Sure, I thought, it looks a bit cutesy, but it’s a puzzle game and looks like fun. Surprisingly it’s actually a pretty tough puzzle game, despite the fluffy animals and pastel graphics. 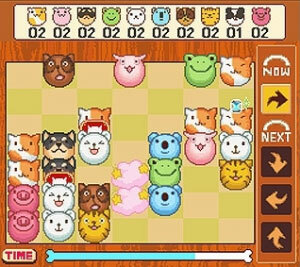 Animal Kororo is a puzzle game similar to Bejeweled or PuzzleQuest, where you have to match up same coloured objects. Here those objects are cute fluffy animals; you’ll have pigs, blue polar bears, frogs and all other types of cutesy critters. The idea is to roll the animals across the board and make them bump into identical animals to make them disappear. It’s touch screen controlled, so it’s simply tap on an animal and send them rolling in the whatever direction you want. You can’t stop an animal halfway a roll though, once rolled it will continue until it bumps into anything (so wall, other animal or obstacle). To make it even trickier (and believe me the above is already tricky enough), the directions you’re allowed to roll are always in the same order: up, right, down, left. On the right hand side of the screen, is a bar that shows you what direction is up next. So it’s not just a matter of rolling animals when you want, but figuring out what the next roll is going to be. There are three types of modes (Attack, Challenge and Battle), each with varying levels (Easy, Normal and Hard). In Attack Mode, you get a list of which and how many of each animal you have to eliminate (see the top line in the above picture). 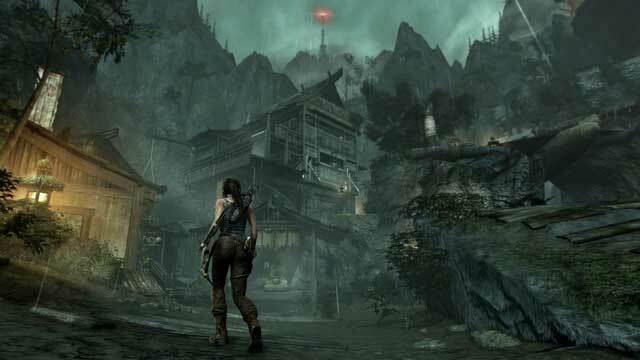 In Challenge Mode, obstacles appear to make the levels more complex. And finally in Battle Mode you can play against a friend through single or multi-card play. In Attack and Challenge mode you also earn points, which can be then used to purchase items for a virtual house. It’s a bit silly, but the creatures are soo adorable, it kind of makes sense they added the tamagotchi element to it. Animal Kororo is a cute little game, yet surprisingly tricky. I know I’ll be able to waste a good number of hours on this while on the tube or plane. And the animals are cute! Animal Kororo is available for £12.00 on Amazon.co.uk. 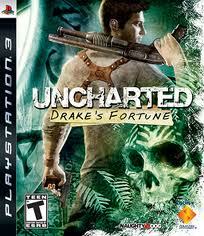 Cristiano and I were able to borrow a Playstation 3 for the weekend, and finally got to try out a couple of games. I mainly wanted to see if our TV could handle the graphics and if it was worth eventually getting a PS3. To be very honest, I would love to get a PS3, but the cost of it just doesn’t seem worth what you get for it in return. My sweet little PS2 takes up way less space and makes less noise, although it of course doesn’t play the newest games. Maybe when the next Final Fantasy is finally released (XIII has a release date for winter in Japan, and XII had almost a full year between Japan and Europe releases), I’ll get around to buying one. For now though the PS2 and Nintendo DS will suit me just fine. 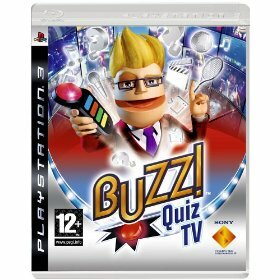 Anyhow, one of the games we tried this weekend was Buzz! 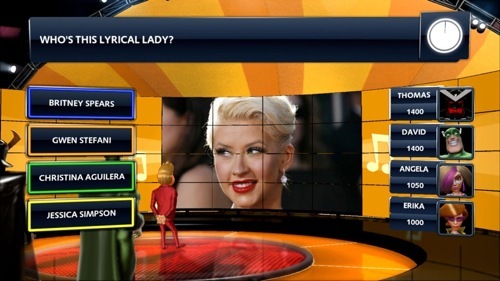 Quiz TV. Buzz! 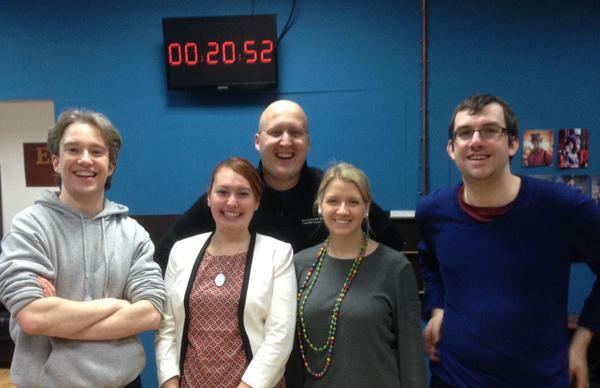 Quiz TV is the seventh game of the Buzz! 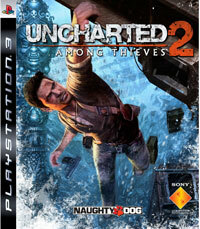 series of quiz games, and is the first to appear on the PS3. It is also the first game to use the new wireless Buzz! controllers. I hadn’t played any of the Buzz! games before, but for a time now I’ve been curious to see how the gameplay is. The Buzz! controllers are great; you get much more a sense that you’re playing a quiz game, when you’ve got a big red button at your disposal. 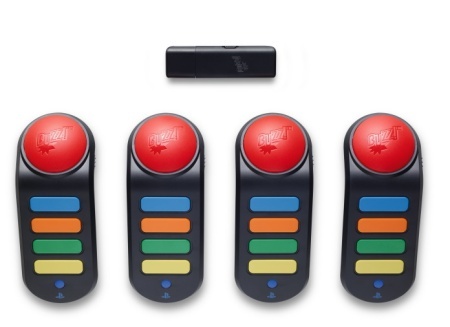 Besides the big red button, there are four smaller coloured buttons (blue, orange, yellow, green) for picking answers from the onscreen options. I love the fact that these controllers are wireless; I can’t imagine playing this game with wired ones, especially with our living room setup. Point Builder: for each correct answer you get 250 points. Pass The Bomb: answer a question correctly to pass the bomb to another player. If you end up with the bomb when it explodes, you loose 300 points. Fastest Finger: the player who answers the fastest receives the most points (400). Every subsequent correct answer receives less points. Pie Fight: if you answer the fastest, you get control of the pie and can throw it at another player. When hit by two pies, you’re kicked out of the round. Point Stealer: the player who answers the fastest may steal points from another player. High Stakes: after a brief description of the topic, you have to bet a number of points. If you answer correctly, you win those points. If you answer incorrectly, you loose the points. Final Countdown: each player is on a raised platform that is slowly moving to the ground. Answering questions correctly slow you from hitting the ground. Answering questions incorrectly speed it up. When your platform hits the ground, you’re kicked out. The player that remains standing wins. 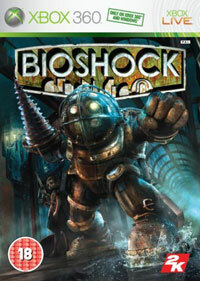 I really liked how this game was setup; the different types of rounds add an interesting aspect to the game. Before each round, the player with the least points is allowed to choose the topic, allowing them to pick other player’s weaknesses (or their own strengths). Some rounds seem a bit unbalanced when only playing with two players (like the Pie round), but it’s still a lot of fun. The topics have a nice range from general knowledge to movies to science and technology. There was the option to play a game within a specific topic (like movies), but I would have loved to seen the opposite: a way to exclude topics. I’m fine with most questions, but I don’t really like sport (and neither does Cristiano), and we would have loved to see a way to leave those questions out of it. 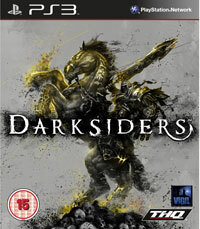 I did enjoy this game and I’m looking into getting a PS2 version. 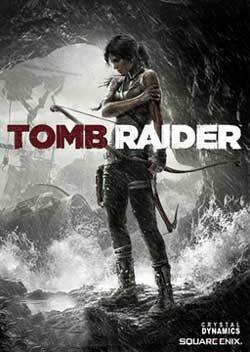 It’s a great party game and more addictive than I first imagined it to be. The wireless controllers are a must-have; they make the game so much easier. I’m now curious to see how the specialized versions are, especially the Hollywood one. 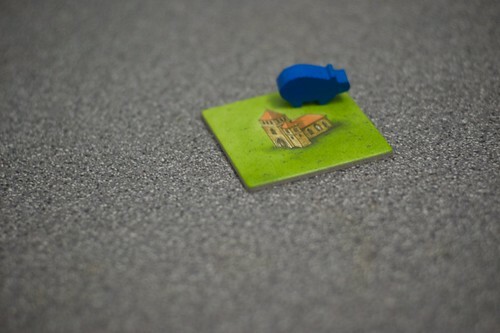 Back at my student house in Delft, we used to play this game a lot. I never got around to getting the game myself, cause the rules said it was only for 3-4 players. We recently found out though that it is playable with 2 if you adapt some of the rules. It’s a great game and one of must-haves for a true boardgame geek. 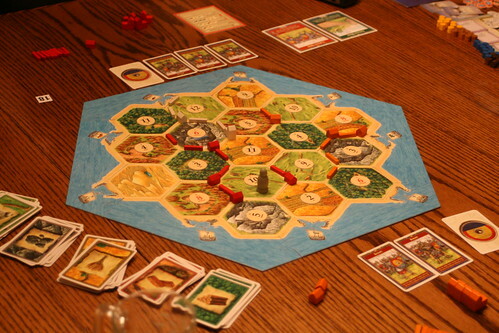 Settlers of Catan is a played on a board of hexagonal tiles, that represent the island of Catan. At the start of the game the tiles are placed randomly or in a specific predetermined manner (but always with sea tiles surrounding it all). The island tiles represent the different resources: grain, wood, brick, ore and sheep (there aren’t any set names for the resources, we keep using other words like wheat, stone and clay too). Numbered tokens are then placed on each of the tiles, except for the resourceless “desert” tile. 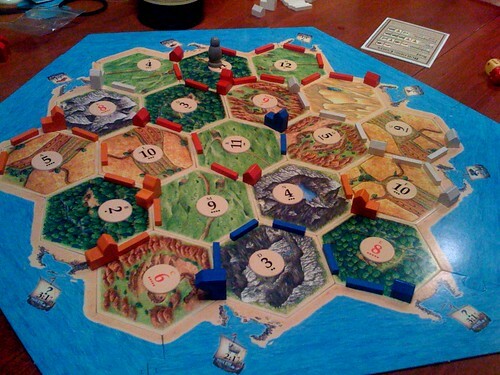 The idea of Settlers is to build settlements and roads at the corners and on the edges of the hexes. Every player starts the game with two settlements and two adjoining road segments, and has to collect resources to be able to build more. You’re only allowed to build settlements at the end of one of your roads, and no two settlements may be built on adjacent corners. 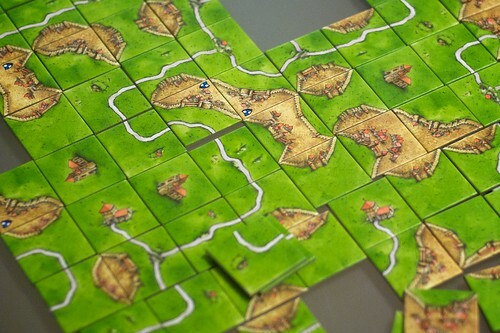 During each players turn, a roll of two dice determines which resources are allowed to be collected: every person with a settlement on the tiles with the number that was thrown is allowed to collect that resource. For instance, in the game in the picture above: if the number 5 is thrown, both the white player and the blue player may collect a brick, while the orange player is allowed to collect a grain. During a players turn that player may spend their resource cards to build more. A brick and a wood builds a road. A brick, a wood, a sheep and a grain builds a settlement. And two grain and three ore builds a city. A city is an upgrade of a settlement, allowing a player to pick up double the resources for the adjacent tiles. Besides the building of the above, you can also use resources to buy a development card; these cards can do various useful things (I won’t explain all the different types of cards here). The winner is the player who first reaches 10 victory points. You receive a victory point for each settlement you have on the board, and two victory points for every city you have (so no points for roads). Various other achievements, like building the longest road, can give you extra victory points. The most interesting aspect of Settlers is the trading. Players are allowed to trade the resources they have in their hand, with other players or “off-island”. During your turn, you can initiate trades with any of the other players (if they are willing). This can be particularly handy if you’re not on a certain resource, while others are. With the “off-island” trade, you can exchange 4 of the same cards into any card you want (with the “bank”). Furthermore, there are special sea ports on the map that allow people with settlements on them better trading prices (like exchanging 2 sheep for anything you want). As I said at the beginning of this post, Settlers of Catan is meant to be played with 3-4 people. From my own experiences 3 is the best number to play with. When you’re with 4 it’s still possible, but the map is slightly more full, leaving less space to maneuver. There are various adapted rules for 2 players floating around on the internet, and I’ve tried a couple of them. I’m still not completely happy with that game play though, and still trying to refine it. 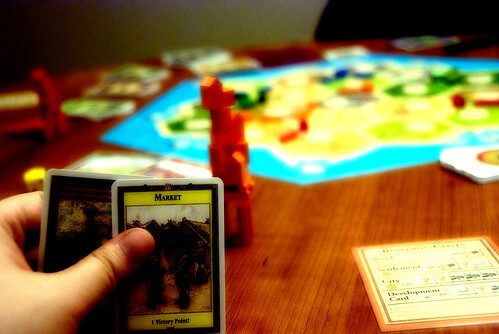 Like Carcasonne, Settlers of Catan is a “friendly” game. All players are in play until the end of the game (unlike Risk) and there are no ways to destroy points from people. There are ways to annoy people though like by refusing to trade, cutting off road routes, taking the longest road (by creating a road longer) and using special development cards. The placement of your settlements at the start of game can be crucial to the rest of your game; you have to give yourself enough space to build more roads and settlements (without getting boxed in), while trying to receive the best possible resources. Settlers of Catan is a fun board game, which requires logical thinking, smooth talking and scheming. There are a couple of different expansions available, but I haven’t tried them out yet. It’s a great way to spend a Sunday afternoon with a couple of friends, and (like I said before) a must-have for every boardgame geek. Settlers of Catan is available for £29.99 at The Orc’s Nest (near Cambridge Circus), £33 on Amazon.co.uk, and $33 on Amazon.com.